Dan Hunter is a lifelong classic movie buff, avid collector of pop culture memorabilia, and co-creator of The Terror Trap website since 1998. More importantly, he is a strong advocate for animal rights and protection issues. A semi-truck. An endless chase on a lonely stretch of highway. In broad daylight. It would seem to take an amazing talent to make those elements scary, but Steven Spielberg was up to the task. When I was a kid in the early 70's, I looked forward to the ABC Movie of the Week. Made for TV thrillers were commonplace - and the first one I remember that made an impression on me was Duel. I sat down one evening in my little rocking chair next to my parents’ bed, in the only room in my home at the time with a color set. I had seen the ad in the TV Guide but I didn’t know what to expect. What I got was a terrifying roller coaster ride of a film. The story was deceptively simple. Dennis Weaver starred as David Mann, a mild-mannered motorist whose mettle is tested after he innocently passes a rig while driving through the California desert. In an act of unparalleled road rage, the incident sends the truck driver on a mission to kill the beleaguered Mann. But hold on a minute. We never clearly see the psycho in the eighteen-wheeler. Is there actually a real person inside…or is it some kind of supernatural demon? Much to the story’s credit (written by the great Richard Matheson) that mystery is never explained right up to the end. Mann has monologues in his head and often seems on the verge of losing his sanity. Who wouldn’t? I’ve always had a fascination with the desert and the west. I grew up in the urban concrete jungle of New York City, a world that couldn’t be more different from the dry, barren landscapes I saw on the small screen. Even as a child, Duel tapped into my fears as a product of Gotham. After all, most of us who live and thrive in metropolitan areas (especially New York) are used to bright lights and activity…noise…and lots of people. Isolation can be a frightening thing. Heck, even the concept of vehicles can be foreign to somebody used to subways and walking everywhere. It’s difficult to believe that Spielberg was only 25 when he directed this gem, although he had shown great promise when he helmed the Joan Crawford segment of the Night Gallery pilot two years earlier. Indeed, his successful depiction of a truck as MONSTER and its struggle to the death with humankind…would preview the brilliant phenomenon known as JAWS. And what of the vehicle that makes the lead character’s life a living hell? 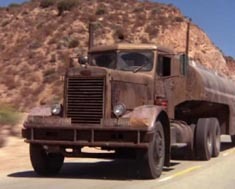 It was a retro Peterbilt, chosen by Spielberg because its front resembled a face! This was one director who knew what he was doing and the picture is a masterpiece of odd angles, editing and unbridled suspense. 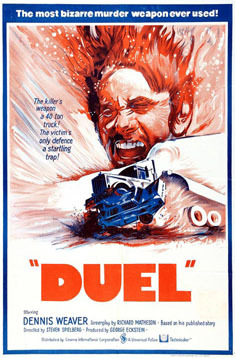 In fact, Duel was so good...it received an overseas theatrical release. Years later, I did some work for a private boarding school for Native Americans and Dennis Weaver was an honorary member of the board of directors. He lived and died in Colorado, and was every bit the rugged, outdoorsy type that he appeared to be on the McCloud series and other roles.